Definition: Hypoplastic left heart syndrome (HLHS) referes to a spectrum of congenital cardiac defects characterized by “underdevelopment of the left heart with significant hypoplasia of the left ventricle including atresia, stenosis, or hypoplasia of the aortic and/or mitral valves as well as the ascending aorta and aortic arch.” (Tchervenkov et al Ann Thorac Surg 2000). The incidence of HLHS is 2-3 per 10,000 live births in the United States. It is the most common form of functional single ventricle heart disease. 1.5-to-1 male to female predominance. If left untreated, HLHS is responsible for 25-40% of all neonatal cardiac deaths. Exact etiology is unclear. Animal studies have suggested a primary anatomic defect of the left heart leading to altered blood flow through the left heart, resulting in secondary malformation of the left cardiac outflow circuitry (Sedmera et al Anat Rec 2002). Aortic atresia with mitral atresia: most severe, retrograde blood flow, and systemic output is entirely PDA dependent (A). Aortic atresia with patent mitral valve: inflow without outflow, resulting in LV hypertrophy (B). Aortic valve stenosis with patent mitral valve: antegrade blood flow, mild end of the HLHS spectrum (C). 50-60% of HLHS diagnosis is made by routine obstetrical ultrasound during 2nd trimester (18-24 week gestation). If diagnosed in utero, in a highly specialized group of patients where there is severe aortic stenosis but relatively preserved LV volume, prenatal aortic valvuloplasty may prevent development of full HLHS. Initial presentation and survival depends on the presence of both a patent ductus arteriosus (PDA) and a nonrestrictive atrial septal defect (ASD). In babies without a restrictive ASD (~90% of HLHS babies), a combination of a PDA and high pulmonary vascular resistance can produce a “honeymoon period” where they have little to no symptoms. Some babies may appear slightly dusky in the nursery, while other may not have any signs and may even be discharged home. As the ductus closes and pulmonary vascular resistance decreases, babies will become symptomatic with cyanosis, decreased peripheral pulses, hypotension, acidosis, and respiratory distress. In babies with a restrictive or absent ASD, severe cyanosis and respiratory distress will present at birth along with pulmonary venous congestion. Decreased growth velocity in late pregnancy is seen in fetuses with HLHS; these babies are born small for their gestational age. HLHS cyanosis is a subset of shunt physiology, thus it is refractory to supplemental oxygen. There is typically no audible cardiac murmur on exam! There is usually only one loud second heart sound due the absence of the aortic valve and therefore the lack of the A2 component of the second heart sound. Initial management aims to sustain life by maintaining adequate systemic circulation and mixing of oxygenated and deoxygenated blood. Assess the presence of adequate ASD. If restrictive or no ASD is present, transcatheter (rarely surgical) atrial septoplasty is performed to maintain pulmonary venous return to the right side (pumping side) of the heart. Babies whose HLHS is severe many develop heart failure, which may require management with diuretics and inotropes. The best long-term management option for most babies involve three staged palliative surgical reconstruction performed within the 30 months of life. Neoaorta is constructed using proximal portion of the main pulmonary artery (PA) and aorta to allow the right ventricle (RV) to serve as the pumping chamber for systemic circulation. A shunt is created between aortic circulation and proximal right PA to establish a source of pulmonary flow. Atrial septum is permanently resected. Stage 2: performed at 3-6 months of age. Glenn procedure. Babies typically hospitalized for one week and are discharged with oxygen saturation in the low 80’s. Stage 3: performed at 18-30 months of age. Fontan procedure. 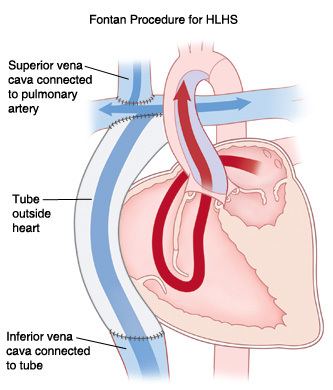 Inferior vena cava (IVC) is connected to the right PA creating a total cavopulmonary connection. The ultimate goal of the three-stage reconstruction to create a circuitry where a single right ventricle is pumping blood, in series, into both systemic and pulmonary circulations. Management of patient after the first stage of repair is the most difficult. Most babies are discharged home following stage 1 reconstruction in 3-4 weeks. By the time of discharge, most infants have oxygen saturation between 75% and 80%. Causes of death: arrhythmias, repair failure, shunt stenosis/thrombosis, single ventricle volume overload, and coronary ischemia. The primary pediatrician is critical in establishing successful collaboration and coordination among medical specialists during this period. 5-year survival is approximately 65-70% for babies who have successfully undergone stage 1 reconstruction. 15-year survival is estimated to be 40% (Siffel et al Pediatrics, 2015). For babies who survive past 12 months, their long-term (>18-years) survival approximates 90%. Long-term morbidity for HLHS is still under investigation as more babies survive the three-stage reconstruction. Currently available data suggest babies who complete the three-stage reconstruction do have some degree of physical and mental diminishment. One study found decreased exercise tolerance in children as they age (Jenkins et al J Pediatr 2008). Babies with HLHS may be at increased risk for neurodevelopmental deficiencies, independent of their initial surgical management. Thus, the pediatrician is critical in careful long-term surveillance and early intervention referrals (Marino et al Circulation, 2012). These babies are at increased risk of thromboembolic complications, and should receive long-term low-dose aspirin (Giglia et al Circulation, 2013). One study found that HLHS babies remain small and underweight at 3 years of age (Burch et al J Am Heart Assoc, 2012). Ultimately many of these babies may require heart transplantation. The topic of transplantation in HLHS remains a controversial topic (Kon Pediatrc Cardiol, 2009). HLHS is a rare congenital heart defect characterized by underdeveloped or absent left ventricular and left-sided valvular malformation. Prompt medical and surgical intervention is needed for survival. The pediatrician is critical in both the initial recognition and long term follow up management of babies with HLHS. Burch PT, Gerstenberger E, Ravishankar C, et al. Parent versus child-reported functional health status after the Fontan procedure. Pediatrics 2009; 124:e942.